Blooms and more: There are plenty of plants and flowers to see this weekend at Plantasia at the Fairgrounds in Hamburg. Visitors also will find outdoor decor, lighting options, table settings, fire pits and much more for their gardens and landscapes. Getting out in the garden sounds pretty good right about now. Socializing with friends out there sounds even better. Soon, both can happen. In the meantime, Plantasia – the annual garden and landscape show – is underway today through Sunday at the Fairgrounds Event Center and Artisan Hall in Hamburg. This year’s theme: A Party in the Garden. 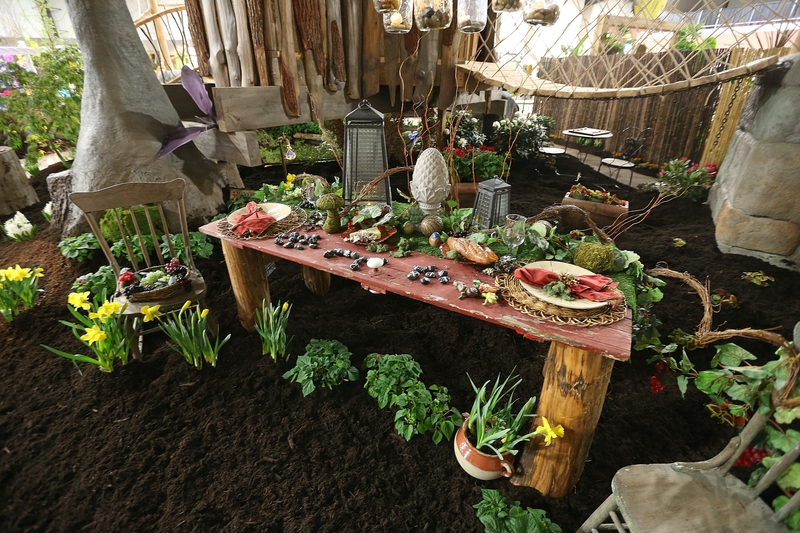 This is the place to see blooming flowers; shrubs; water features; fire pits; grills; outdoor furniture, structures and materials; patios; and garden lighting and decor – some of it party-ready to reflect the show’s theme. Garden displays have been created by local nursery and landscape professionals, and there is a lineup of hourly seminars by local experts that are free with admission. Topics include “Successful Do-It-Yourself Pruning,” “Things Gardeners Should Know but Don’t” and “Fairy Gardens.” You can check out seminar times and topics on the website, www.plantasiany.com. In addition, vendors will be selling garden- and landscape-related items. Now in its 14th year, Plantasia is presented by PLANT WNY, formerly known as the Western New York State Nursery & Landscape Association. One improvement returning visitors may notice this year: “We made an effort to bring in a lot more large trees for greater impact,” said committee member Phil Colarusso, of Luminated Landscapes. Visitors also will find some impressive ways in which exhibitors repurposed materials. A 23-foot-tall tree house with two bridges – including a suspension bridge – was constructed from reclaimed hemlock, noted Rico Rivera, who owns Buffalo Tree House with his wife, Jyl. Chevalier Outdoor Living handled the exhibit’s stonework and landscaping. “We see raw materials that other people would disregard, and we turn them into something,” said Chevalier owner Mike Frank, referring to such things as wood and stone. The tree house garden is just one space the kids will enjoy seeing. There’s also the interactive Aurora Waldorf School’s Children’s Garden with crafts, face-painting, jump-rope making, puppet show and other activities. And some kids will undoubtedly request an outdoor family movie night after seeing the outdoor film-viewing area created by the Cutting Edge. Good luck convincing them to wait until summer. Finally, in addition to getting advice and tips from experts on hand, don’t be surprised to hear some garden and landscaping philosophies along the way as well. “A real outdoor space evokes emotion without saying a word … Our goal is to get people out of the house and away from the TV,” said Chevalier’s Frank. Colors, sounds, textures and many other elements all come together to create a space of one’s own. “If you have a job that is stressful, you want to come home to an outdoor space that is calm and serene. If your job is boring or less stressful, you want a space that is more lively,” he said. Perhaps, even, a party in the garden. What to know: Plantasia, which opened Thursday, continues through Sunday at the Fairgrounds Event Center and Artisan Hall, 5820 South Park Ave., Hamburg. Hours are 10 a.m. to 9 p.m. today and Saturday; 10 a.m. to 5 p.m. Sunday. Tickets are available during show hours at the Event Center’s Box Office. General adult admission, $9; senior citizens, $6 (age 60 and older; no other discounts apply). Children age 12 and younger are free. See www.plantasiany.com for lists of educational seminars, exhibitors, vendors, events, general admission discount coupon, directions and the Aurora Waldorf School’s daily schedule of events for the children’s garden. Parking is free.